Recipe for making Lemon Tarragon Cocktail Meatballs. 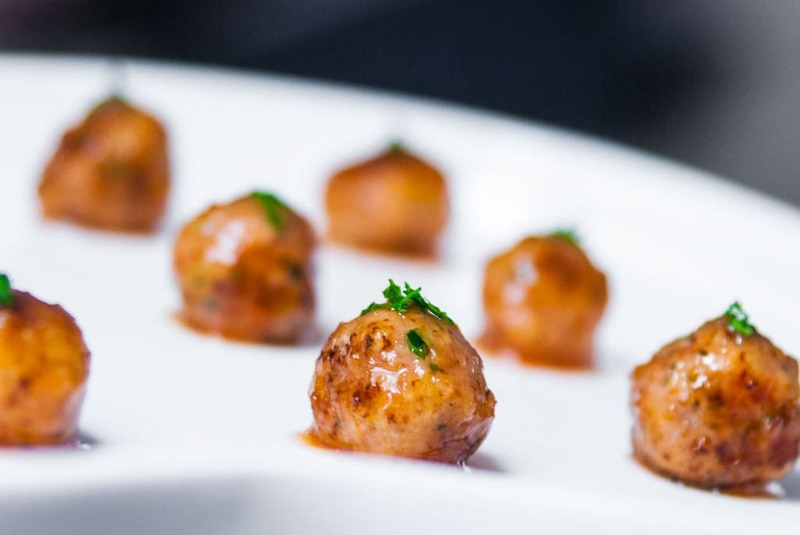 Learn how to make these bite sized cocktail meatballs with a caramelized tomato glaze. I spent the first three days of this week in the kitchen preparing for a 75 person cocktail party I catered on Wednesday. It’s the first time I’ve ever done anything on that scale, and to be honest, it was a bit daunting. It all ended up working out in the end though and these polpette glazed with a caramelized tomato sauce were one of the most popular trays, coming back empty almost every time. As I was planning the menu last week, I noticed that I don’t have much in the way of canapés on this blog. It hasn’t been intentional, but I don’t do much of this type of entertaining personally, so I really had to do a bit of thinking to come up with a list of Italian themed bite sized hors d’oeuvres that I could prep ahead and assemble onsite. These polpette were among the 5 menu items the client chose. I figured it would be simple, could be prepped ahead, then glazed and heated at the last minute. Unfortunately, there was no heat source at the venue and the client wasn’t too keen on having a convection oven brought in, so I needed to make a polpette that would be moist and tender, even at room temperature. My solution was to use a high percentage of breadcrumbs (about 1/3 by volume) along with a mix of gelatin and egg yolk to emulsify and stabilize the liquids in the mixture. Unlike the proteins in meat, that have a tendency to tighten up and squeeze out moisture, the bread crumbs are like a sponge and will absorb liquid and retain it, even after being cooked. The egg yolks act as an emulsifier, helping the fats and meat juices mix, and together with the gelatin they act as a stabilizer, preventing the secreted juices from leaking out all over the pan. These polpette nearly melt in your mouth when served warm, and while much firmer at room temperature, they’re still quite tender. Rich and creamy with a bright zing from the meyer lemon zest and tarragon, these meatballs are glazed in a caramelized tomato sauce that gives the polpette a lacquered sheen that rounds out the meaty vegetal flavours with some sweet concentrated fruit. Whisk the cream, stock, yolk, salt, onion powder, and gelatin together. Let the mixture rest for 5 minutes to allow the gelatin to rehydrate. Add the panko, cheese, parsley, tarragon and lemon zest and mix to form a paste. 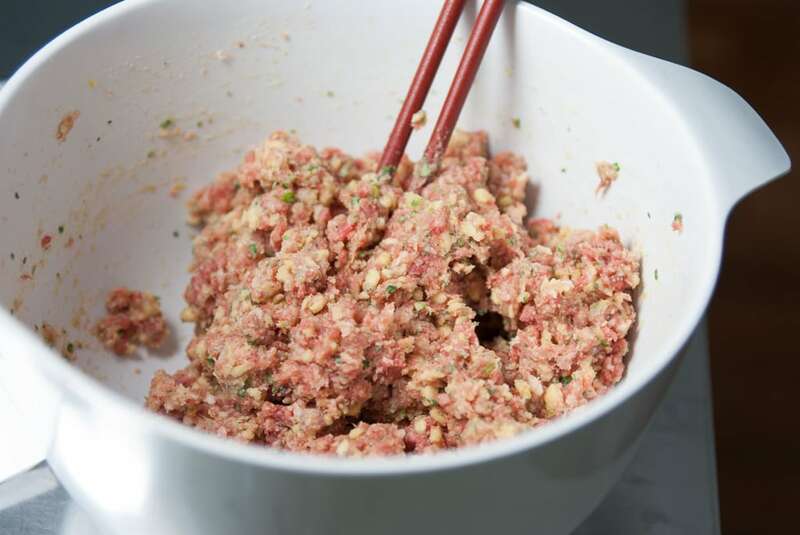 Use a fork to mix in the beef and pork using a cutting motion rather than a mashing motion. Be careful not to over mix. The mixture should be somewhat crumbly looking, and not smooth like a paste. Put the mixture in the fridge to rest. To make the caramelized tomato sauce, heat a saucepan over medium heat and add a splash of oil. Pour in the the pureed onion and cook stirring occasionally until the mixture turns into a light brown paste. Add the wine and turn up the heat to high, letting the mixture boil down until there is almost no liquid left and the mixture is medium brown in color. Turn down the heat to medium and add the tomato puree, sugar and salt. Cook, stirring occasionally until the mixture is reduced by about half and the sauce is thick and glossy. Roll out the meat mixture into 3/4" balls then heat a non-stick pan over medium heat and add a splash of oil. Add the meatballs to the pan, being careful not to overcrowd the pan. Fry the until brown on one side, flip, then brown the other side. Slice a polpette in half to test for doneness. Dip the cooked meatballs in the tomato glaze and serve. I just saw “polpette” on my RSS feed and I knew I had to zoom over here as soon as I could! I can totally see why these are one of the popular trays– they look so good! (Nice job on the presentation too, with the lilies.) Any chance this catering gig will be a more permanent thing? I am sure they were thrilled with everything you prepared but these def. take front stage! You adapted perfectly for the circumstances. Bravo! BTW, I blanched the ramps, drained them and covered them with a light vinaigrette, marinated 1 hour, discarded some of the vinaigrette and served with grilled steak. Thanks! No surprise! These look so good. These pics are just fantastic. I´ll try the recepie. They may work with chilly, what do you think? The lemon and herbs sound great as does the tomato glaze. I’d love to try this with tuna. I have never had polpette but judging by your ingredients, your recipe sounds wonderful. If I was at that party, I would have gobbled these up too. Those look awesome! Glad to hear the party went well. These look delectable. Beautifully glazed. They are the exact sort of succulent little bite that’s perfect with a drink. I am going to try the panko in my meatballs (polpette) next time. 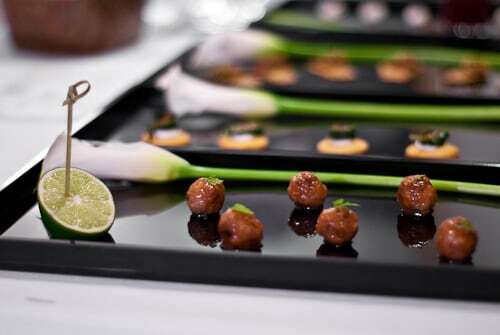 The presentation is beautiful with the cala lily on the plates. Lovely! These are fantastic Marc…again, I love your thinking behind these bite sized morsels and how you managed to keep them nice and moist. Good luck if this is something (catering) you plan on undertaking…I’m sure with these types of dishes and that gorgeous presentation, you’re on a real winner! I was wondering how the event went. Knew it must have been a huge amount of work. Will we see other elements from the menu? I like your scientific approach to solving the no-heat catering problem. Good question. I just really like the grain and uniform size of panko. Tearing up fresh bread inevitably leaves big hunks of bread and normal breadcrumbs are too small for my tastes. My criteria for a good appetizer: delicious, easy-to-eat, and memorable. You nailed it. These look terrific! Hi! The right post at the right time!! Next week on sunday I’ll have to prepare a buffet for 30 people and this recipe is an absolutely good idea!! Lovely! I just auctioned off with my friend a catered day cruise on my friend’s sailboat. This sounds perfect to go along with our mediterranean-themed food. So are you doing catering now? Wow. Big job. I had a party of 6 yesterday and that took it out of me! 🙂 These look absolutely delicious. Awww – I love your food. This looks fantastic! Sitting on the platform at the Crestwood station after foraging in the sun, those polpettine were the closest thing to paradise. Even at room temp and eaten with dirty fingers from a plastic container. Go make those meatballs people! Wow! Your trays look so elegant. Great job and awesome improvisions! I like that tomato sauce and it sounds very versatile. Going to have to steal it (ok I give credit where credit is due but dang it let me think I am being sneaky). Marc, I’m truly inspired. I’d love to hear more about your thoughts on preparing for the event, and some more photos please!